Ironman Triathlons are raced across the same distances 2.4-mile (3.86 km) swim, a 112-mile (180.25 km) bicycle ride and a marathon 26.22-mile (42.20 km) run, raced in that order and without a break, wherever they are staged in the world. However, what really make some events harder than others are the different weather conditions and course difficulty includes open water conditions and elevation profile and winds. My first Ironman happened right after a crazy accident, click here to read the quick story. I was now in South Africa doing my 3rd with a target of sub 12 hours. The toughest course by far. For the first time I was racing injury free. I had 40 stitches in my mouth during first and a fractured toe, for the second race. PE is known as the city of winds and crazy weather conditions. Cyclists and swimmers know what that means to a race. When you have headwinds and elevation of about 1400 meter and choppy and cruel Indian ocean to swim in or when you start a race at 20 degrees and start running at 37 degrees and finish the race at 15 degrees. Crazy is an understatement! Route Recce: I was now scared! A small route recce ride for about 30 kms and I knew this was not going to be easy at all. The winds were so crazy that day and had a solid head and cross winds , it was scary, very scary. I was trying to ignore my PB thought. Race day: Never Plan. Just Embrace. Just a few hours before the race started, I got my invite to the much privileged Ultraman Race in Florida 2018. 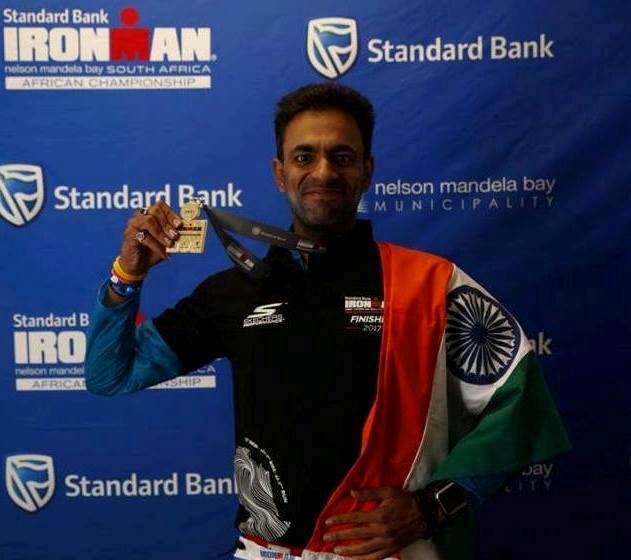 Knowing that only 50 athletes from around the world are exclusively invited for it, gave me unbelievable faith as I started my Ironman South Africa. As mentioned PE changes weather every 10 minutes. At that moment everything looked fine though. I was excited! I was injury-free for the first time. I was ready to give it all. My impatience and excitement was automatically moving me towards the start line. The first 300 meters of swim were very comfortable. The big surprise came at the left turn when I saw the real face of the Indian Sea – I knew that very moment it was like something I had never seen. Huge waves. Water currents slapping me, continuously beaten up by water and drifting away. I wasn’t shaken still. I had to bring in my focus on my strokes and sighting, I kept telling myself not to get carried away with drift and currents. I had to stop myself from getting drifted. I kept correcting myself continuously non stop. I wanted to puke so many times, felt sick and felt tired but focus was to swim in the right direction. I was now getting thrilling. I was doing just fine as I could have in given conditions and with my not so long swimming background. 1.35 hours later, I was out of the water. Slower than my target. The one thought that crossed my mind was – My PB was 1:20 in Mallorca two years back with 40 stitches and 3 wounds on my face. I was feeling sea sick, nauseous and disoriented but I had the big job of transitioning right infront of me. And even though I had planned the transition over and over again in my mind and plan was to do it in 5 min, I took 7 mins. Transition means taking time to take off wet suit and watch, wearing the cycling jersey, putting on the race belt, loading nutrition in cycling jersey, drinking fresh water, taking in nutrition, finding your bag, finding your bike, putting on helmet-gloves- sun glasses- compression-socks –cleats and finally running in cleats with your bike as you can not mount your bike till you reach start point. This is how it went for me : Twice I felt blacked out (( I still have to figure out where I went wrong with my nutrition and hydration) , first it was 65 km mark and then at 110 mark. I didn’t stop but second time I thought it was better to take it easy at the next aid station. The moment I stopped and looked at my Garmin, My average speed had started dropping. I neglected every negative thought passing by my brain, poured some ice cold water on my head and pulled at it again. As usual, you have got to be playing mind games with your brain. It starts getting weak, that’s when you have to think of something positive to pull yourself up. If you don’t you will lose it. Your body is a machine and it will do whatever you will tell it to do. P.S. During Ironman race if you push hard on your bike , the payback is 10 times during running. But I did not care, I thought to myself that I am here to give best in my ride and running will see when it comes. Luckily I got some tail winds for the last 20 km, making my last 20 km split as fastest. I was still slower than what I had planned but was very happy after finishing the course, knowing this course does not get easy in any way! So I made Ironman as a bike race in my head with swimming as a warm up and running as cool down. It was 3 PM, 35 degrees. I was completely drained, exhausted and dehydrated. Feeling totally uneasy, I took 5 mins to change shoes, keep bike on rack and refuel my nutrition. Slow Transition again. I had just got my PB in SCMM 3.29 min and targeting sub 4.30 is realistic target in Ironman but I couldn’t run even 10 steps right now. It was terribly hot and I kept drinking Coke at every aid station. I knew I was doing the wrong thing. But I was dehydrated and wasn’t behaving rational. I started walking. I looked at time and thought to myself that with this pace, I might not even finish in 6 hrs. I had overdrawn my energy during bike course. I was suffering intensely. When I had finished my first loop i.e the 10 km mark, I saw Nagender Singh starting his run course and he looked very fresh and was ready to take on run strongly. He pushed me and motivated me to use whatever energy we could spare for each other. Nothing was working for me. I was again walking after a short run. I think it was the heat which was bothering me much than the lack of energy. For the first time in all my races in the last 5 years – I crashed. Two guys came to check If I was alive. I still kept a timer of 90 seconds for a crash 😉 and yes it helped. I could now run a stretch of 1 km. I took charge of the situation. I told myself to have no more coke as I was feeling bloated and nausea at the same time. I already knew 12 hrs target is way past gone but still way ahead to do my new PB. I stopped refueled myself with a gel and sip of Red bull for a kick of caffeine and this was the time, the peak heat was setting down and half the course was now covered in a shade from the building around and now it was a time to run the race. I gradually started picking up from this point and kept moving, this time much faster than first 17 km. My stops at aid stations were only to hydrate with water and cool down body temperature by pouring water on head. I made it into 3rd loop to 4 th loop much quicker than I thought. Last loop and I was at 32 km mark. I met Negi again. We decided to push each other. He pushed me for sub 13., I knew it was possible. I again calculated the timings in my mind and pushed really hard. It was the last 4 km already and I really needed to run to full throttle to get to do sub 13 and that’s where I met Deepak, I told him my plans and he agreed to pace me. This is what I needed – a friend to pace me in the last 4 kms. I must have had ran the hardest in any race in the last 4 km and was doing sub 5 pace when people limp, struggle to walk, struggle to jog. When nothing works and you struggle or you have to give your best, its best is to dedicate that part of run to someone you think more important than yourself and the magic carpet arrived and I knew it was sub 13 but could not see the watch in excitement, it was 12.58. IM South Africa is special in every way. 6 months back I became a father. For me it was a victory and had never relished the finish so contented. Wow. So well written. I am mesmerized by the entire flow, very inspiring indeed. Congratulations Gaurav. Wow!! Thats quite an inspiring run…. I mean hats off to you and yeah mind games can make or break the race…. Cheers!!!! Exactly. The mind leads the body. Thanks for stopping by my blog!